We’ve worked with some of the largest companies across the globe engaged in the life sciences, healthcare and wellness industries. We are committed to harnessing information, research, and analytics to help clients optimize their business and competitive strategies. We are not just another “big data” analytics company. What we offer is deep expertise in healthcare and the life sciences and a strong understanding of how these pieces fit together. This expertise ensures that we understand our clients’ issues, environment, and culture which allows us to provide strategic insights and answers to critical issues and questions impacting them, their customers and competitors. Read about MoBi Maps, our Patient Experience/Behavioral Segmentation Platform. Our expertise and longstanding experience in healthcare and the life sciences facilitates our ability to gauge the constantly shifting regulatory landscape, while also identifying opportunities for product innovation, process optimization, and risk management. We continuously listen to and engage with physicians, healthcare CEOs, patients, and payers. Our goal is to understand where they “live,” and how they think about the issues that matter most to our clients. These perceptions, preferences, voices, and behaviors need to be mined, parsed, and synthesized for interpretation and insight. 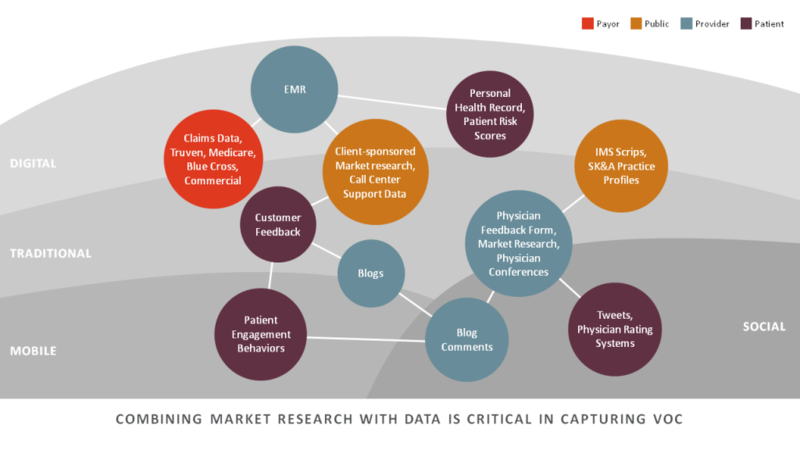 Accurately interpreting the most important qualitative factors, including: motivations, perceptions, opinions, attitudes, and beliefs, in order to successfully “connect the dots” across the healthcare continuum. Continually developing and implementing analytical breadth and depth. Synthetic thinking, working cross-functionally and integrated across disciplines and geographies, we look to get a deep understanding of the issues. Testing results for their insight and ability to guide client decision making.